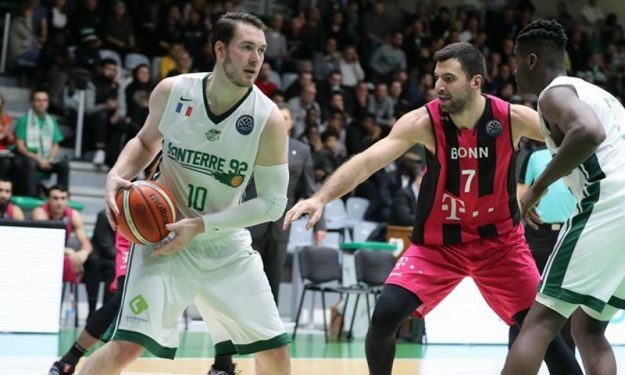 Hugo Invernizzi led Nanterre’s charge to a road win over Chalons-Reims in the French League. Nanterre went ahead in double-digits by halftime and kept going for a convincing 102-77 road win over Chalons-Reims on Day 18 of French League. Hugo Invernizzi led the charge with 19 points while Lahaou Konate and Jeremy Senglin added 14 points each. For Chalons-Reims, Blake Schilb scored 19 in addition to Gedeon Pitard and Devin Ebanks’ 12 points each. Nanterre improved to 12-6 standing behind Lyon-Villeurbanne (13-5) together with Pau-Lacq-Orthez (12-6) while Chalons-Reims holds a 7-11 record.